This revision of the follow-up to the popular A Godward Life adds twenty fresh entries to the original 120 daily meditations that are solid meat and sweet milk from God's Word. The new entries broach current and controversial subject matter, such as partial-birth abortion and gay marriage. Piper asks the hardest questions and finds wonderfully poignant but practical and applicable truths from the Bible. These 350 pages of substantive spiritual nourishment will brace readers' minds with truth and nourish their hearts with God's sovereign grace. Pastors and lay leaders particularly will appreciate the three indexes included. They don't need to look any further to find a pertinent illustration or tidbit of inspiration! Taste and see&...The Lord is good. The soul tastes truth like the lips taste food. Spiritual hunger cries out for rich, substantial nourishment. It is remarkable how much meat these daily portions contain. Skillfully presented by pastor John Piper, this devotional of contemporary meditations on biblical reality will whet your appetite for more of God Himself and refresh you in your daily communion with Christ. "This volume is a treasure of true doctrine applied to life." "Going to sleep with John Piper's words on your mind will coax you from complacency and wake you up to a passionate faith." 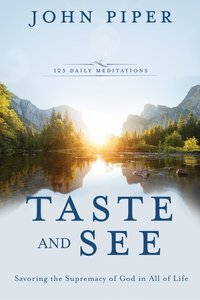 Customer Reviews For "Taste and See"